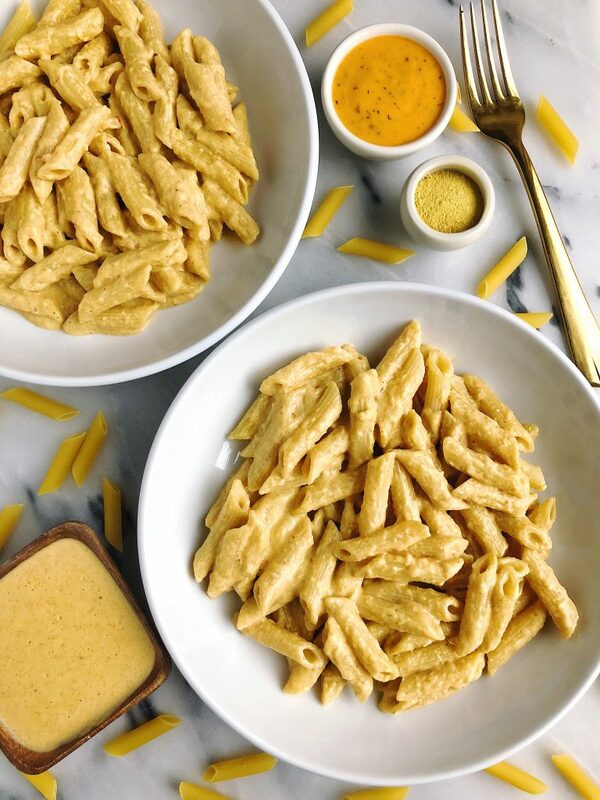 Vegetarian Buffalo Mac & Cheese made with gluten and dairy-free ingredients for a spicy twist on a classic recipe! This recipe. 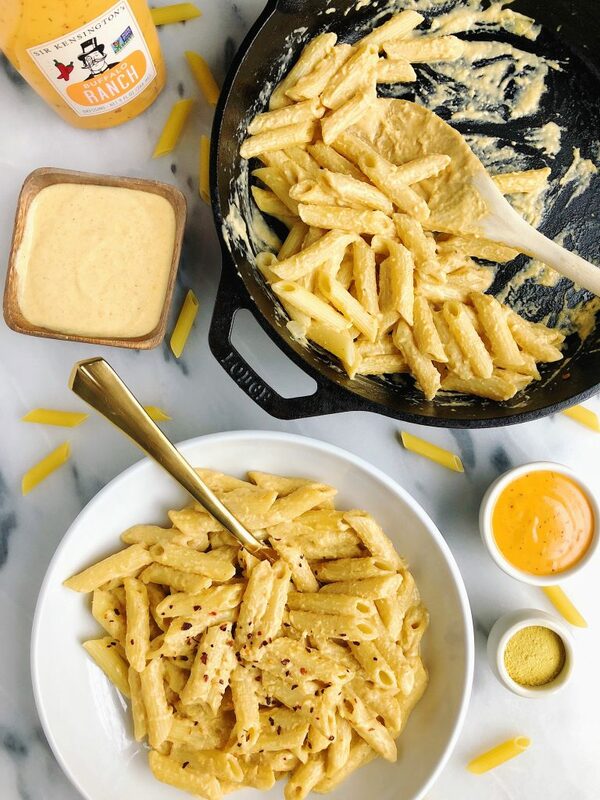 You guys are going to go CRAZAY over this Vegetarian Buffalo Mac & Cheese. Besides the fact that it is gluten and dairy-free! There are many reasons why I love this recipe but here is the main juice..
For one it is made with minimal ingredients and cheese is not one of them. Shocker, I know! Rachel creating another cheese-less mac & cheese recipe. 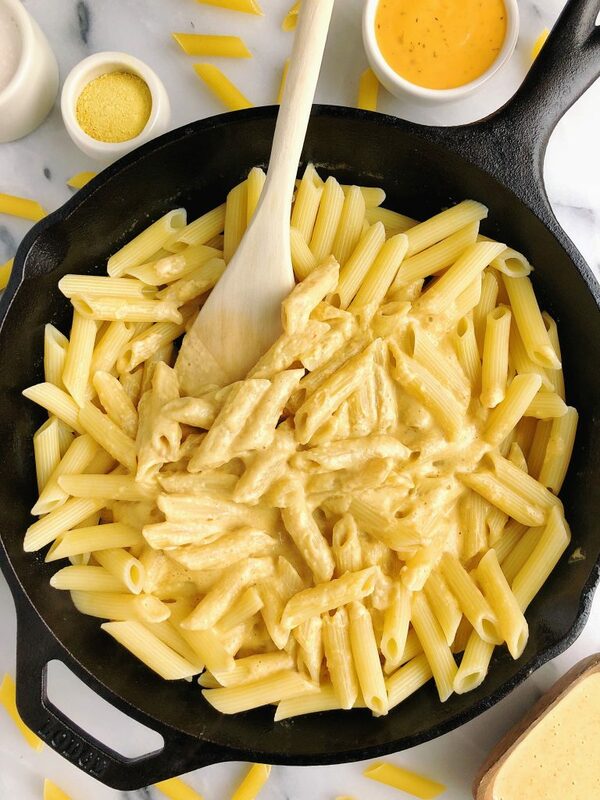 But there are so many possibilities with mac & cheese I can’t stop. I love that this one doesn’t have squash or cauliflower in it either. It has a base of nut milk, cooked garlic and onions, spelt flour and the main star of the show: Sir Kensington’s NEW Buffalo Ranch Dressing. I die. Sir Kensington’s new ranch dressings line is INSANE! I was able to try this earlier in March and it is unreal. They have four different flavors: avocado ranch, ranch, pizza ranch and buffalo ranch. All completely sugar, soy, dairy and gluten-free and made with wholesome and healthy ingredients. Like Humane Certified Eggs and a buffalo sauce made just for the ranch! Sir Kensington’s Buffalo Ranch is so flavorful and delicious. 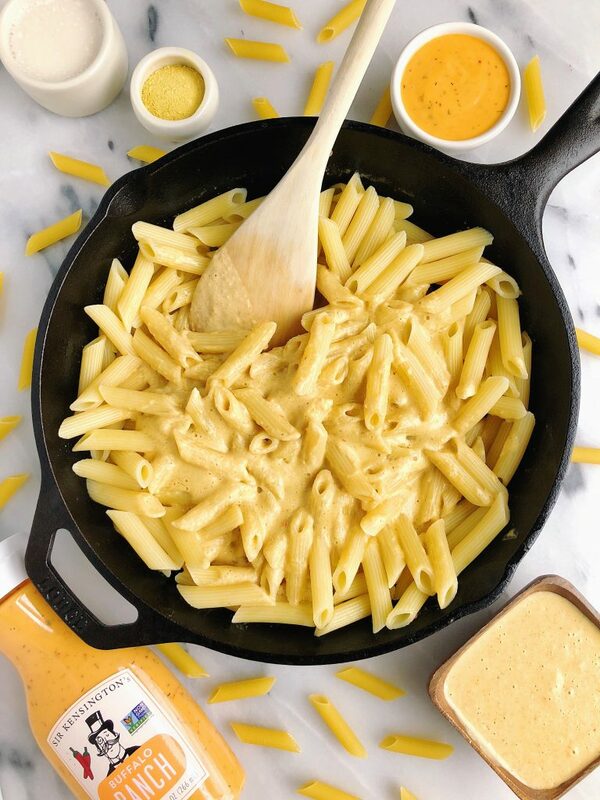 It adds the perfect kick to the “cheese” sauce. It is also delicious in salads or to dip your veggies in. You can absolutely add some grilled chicken or even some bacon to make this a bit heartier with protein, but it is also dreamy as is. Head on over to Sir Kensington’s site to learn more about their new ranch line. It will be hitting retailers in APRIL! Let me know if you have a chance to try them! I cannot recommend them enough. Thank you Sir Kensington’s for sponsoring this post! It means so much to me to work with brands I love and believe in! Great blog and I love what you have to say and I think I will tweet this out to my friends so they can check it out as well. Thank you for sharing dairy free recipe.